Despite overwhelming public opposition at every turn for more than two decades, the Jumbo Glacier Resort has slid through every approval loophole to overrule the voice of the local populace. At the heart of every development is the question of land-use: what is the appropriate use of our land? The normal avenue to discuss this question regarding a ski resort is through the regional zoning process. However, the proponent never applied to re-zone the Jumbo Valley. Instead, legislation was amended TWICE by the BC government to promote Jumbo Glacier Resort (JGR) and circumnavigate the democratic process. This is a long and sordid history; we’ll start with where we are at now and work our way backwards. On February 19, 2013, the face of democracy in BC changed forever. The Jumbo Glacier Mountain Resort Municipality (JGMRM) was created by the BC government, encompassing 6,000+ hectares of public land in the heart of the Purcell Mountains, making the wild Jumbo Valley the first municipality in Canada to be incorporated with no residents, no infrastructure, no budget, and no reliable access. Fifty-five kilometres from Invermere up a rough forest service road, there are no residents on this land other than wildlife like bears, wolves and birds. Nevertheless, the BC government appointed a mayor and two councillors, and granted the new municipality $260,000 of BC taxpayer dollars. An additional $50,000 was granted to the JGMRM from the federal gas tax funding. In April 2014, the JGMRM passed a five-year financial plan that outlined an additional one million dollars of public funding. This provincial funding of the JGMRM was opposed unanimously by the Union of BC Municipalities in September 2014. With municipal elections set for November 2014, while the rest of BC goes to the polls to elect their mayors and councillors, the appointed mayor and councillors will not— no election is required for the banana republic of the Jumbo Municaplity. How did this happen? Read on. Here’s a great article “Democracy Interrupted: How Jumbo Glacier Resort Became a Municipality with No Residents” by award-winning journalist, Judith Lavoie. The BC government made two very troubling changes to the Local Government Act in 2007 and 2012 respectively. Coupled together, these changes allowed for the creation of the JGMRM. In 2007, the B.C. provincial government (the BC Liberals) passed Bill 11 of the Local Government Act. The bill was ostensibly to allow resort area communities to access more financial support through the provincial hotel tax. In 2012, Bill 41 further amended the Local Government Act, effectively changing the face of democracy and land use in BC forever. “…appoint or provide for the appointment of one or more individuals to be the members of the municipal council of the municipality and appoint or provide for the appointment of a mayor from among the appointed members of the municipal council. What the proponents wanted to avoid most was a public rezoning process. All new proposed developments that involve uses not supported by current land use zoning must be rezoned based on public input by the elected officials of the regional government, in this case the Regional District of East Kootenay (RDEK). After decades of intense public opposition, the developers knew this would never fly. So, they convinced the elected officials to request the province to take over the job they had been elected to do in the first place. On a sad day in August, 2009, eight of fifteen regional directors failed their constituents and local governments everywhere by requesting that the Province use their new Bill 11 to take over the final decision on Jumbo by zoning it as a Mountain Municipality. This was the second time the RDEK considered the question of who should be in charge of zoning for the JGR: the first time it voted to keep the decision local, the second it abdicated its responsibility to carry out land use decisions in the Kootenays. The Jumbo Glacier Resort went through a BC Environmental Assessment. In October 2004, the JGR was issued a five-year Environmental Certificate with 195 legally-binding conditions. Read the conditions here. 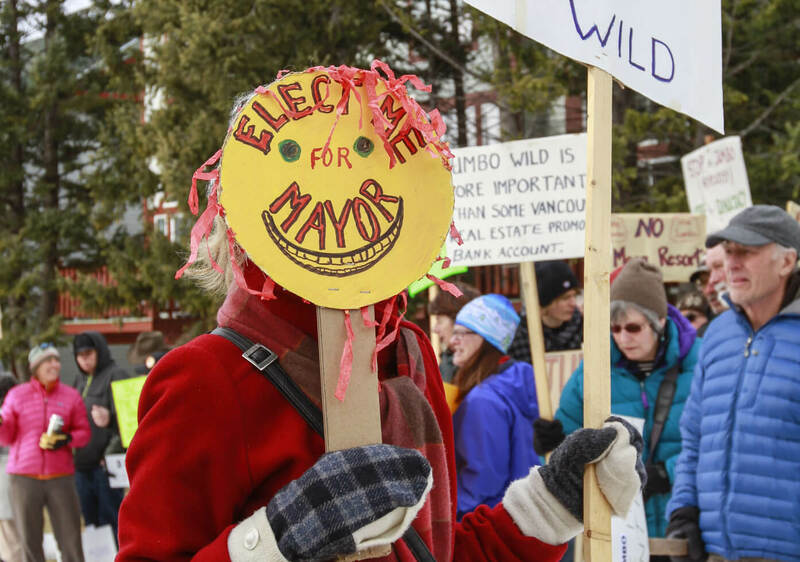 During a 60-day period of public comment on the proposed Jumbo Glacier Resort Environmental Assessment Certificate Application in 2004, the Environment Assessment Office (EAO) received 5,839 comments, 91 per cent of which were opposed to the proposal. The Jumbo Creek Conservation Society alone collected over 1000 letters of opposition and submitted them, only to have the EAO consider them as one single submission. Other than a 2008 attempt by the developer to build a road through sensitive alpine habitat and install a ski lift on the East Farnham Glacier, with no permits, no permission to build, and no resort approval in place, nothing much happened outside the political arena for Jumbo after the Environmental Certificate was issued. A two-month summer blockade of the access road by irate residents halted the unpermitted construction. Investors came and went. More ice melted, and nearly every Alpine Ski Resort in the Kootenays underwent significant investment and expansion of infrastructure and accommodation. Meanwhile, the alpine ski market continued to decline. The EA certificate was due to expire in 2009, but despite cries from biologists and locals to consider new wildlife, economic, and alpine ski industry information gathered between 2004 and 2009, Jumbo’s EC was granted a one-time, five-year extension to October, 2014. It seems obvious that since the proposed resort area is still public land, there should be rigorous oversight and monitoring by BC Ministry Staff of any and all activities on it by a potential real estate developer. In May 2014, JGR submitted a Self-Report on their compliance with the 195 legally-binding commitments, evaluating themselves on adherence to the pre-construction commitments. Read their self-report here. Jumbo Wild campaign partners raised a unified voice of opposition, outlining clear examples of commitments that had not been satisfied. Read our concerns here. The Environmental Assessment Office conducted an Administrative Audit over the summer, concluding that Glacier Resorts was, as of October 8, in NON-COMPLIANCE with their pre-construction requirements. Read the report here. With the audit underway and Glacier Resorts attempting to ram through construction before their October 12, 2014 deadline, concerned citizens established a 24/7 presence in the Jumbo Valley throughout August and September in order to document all activities taking place. The information gathered was pivotal to augmenting information for the EAO during their audit. #88 ‐ to prohibit recreational use of all‐terrain vehicles. In reality, JGR has failed to maintain even their one, solitary gate on the access road to the West Farnham Glacier, and there has been year-round access by ATV’s and snowmobiles into critical mountain goat and grizzly habitat due to this failure. #146 ‐ to monitor, at its own cost, unsupervised public recreational use (including use by resort construction and operations employees, resort visitors and resort residents) and other use of roads which link to Highway #95 at Invermere. This monitoring will be undertaken before construction, during initial construction (i.e., prior to commercial scale resort operations), and during commercial‐scale operations. Monitoring results will be reported to the Ministry of Water, Land and Air Protection Regional Manager (Environmental Stewardship). Has anyone seen anyone monitoring access or recreational activity to Jumbo Pass? Horsethief Creek? Toby Creek? Mineral Creek? This was to have been done in years prior to construction to get an idea of backcountry usage in the area surrounding the resort, to better understand historic, traditional recreation values and existing impacts on sensitive wildlife. Prior to construction, monitoring surveys of nesting songbirds, raptors, grizzlies, goats, recreation use, and drilling and monitoring programs for baseline ground and surface water quality were to have been implemented, yet few if any of these requirements appear to have been met. For more information on some of the 195 commitments, please read this letter to the Environmental Assessment Office. Going back to the beginning, we arrive at the CORE (Commission on Resources and Environment) process in the mid-1990’s. After a multi-year process, CORE table representatives zoned Jumbo as ‘unsuitable for rural or urban development’. However, when the final report came back from Victoria as the East Kootenay Land Use Plan, planner Stephen Owen inserted Recommendation #75: if a resort was to be considered for Jumbo, a Provincial Environmental Assessment Process that considered public input was required.